After an arduous journey through a sea of troubles I find myself sitting at the Hotel Nacional, taking in the smell of the waves crashing against El Malecon de Habana. Four hours in the air, twelve hours in the terminal, and countless of calories consumed through airport junk food has brought me to this moment in time, both antique and modern. Brand new Nissan Centras ride the roads next to Chevy Bel Airs as the air is filled with the sounds of Sinatra and Bieber. It’s a place fluid in style and in culture. However, as we traveled closer to our rescidencias, the environment took on an entirely different atmosphere. Gone were the military and pro-Communist influence, replaced by soft lighting and bright colors. It was as if we had ended up on the shore of a Latin American metropolis. Of course, this could have been a side effect of a 9 PM to 3 AM flight delay. 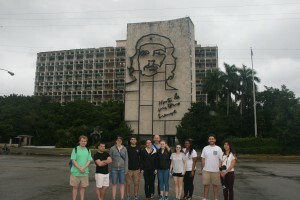 This dichotomy continued on the first morning (2 hours later, mind you) when we awoke to a grey, drizzling sky and a trip to the Jose Marti Memorial, directly in the heart of the government center, and thus Havana itself. The bland constructionist architecture blended in with the overcast sky behind it, creating a drab plaza littered with red stars. The pride of socialism was made most present by the large statue of Marti, imposing over the square and its inhabitants. 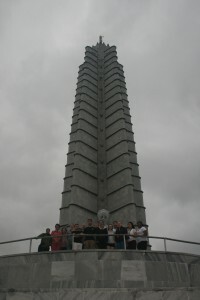 The interior of the concrete tower he guarded contained his entire history, of fighting and freedom, of diplomacy and exile, showcasing the Cuban trait of independence. And yet as I stared at the iron mural of Che Guevara, I wondered where the homely city fit in with this ideal. 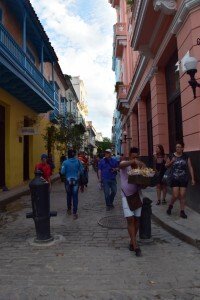 With that question in mind, the second say brought us an even stranger twist: Old Havana. The bright palate and Spanish architecture lit the streets in a festive atmosphere, fueling a chic and paradiso vibe. Walking among the throngs of tourists, I saw capitalist-styled shops and artistic street performers akin to something you’d find in an American or European city. Gentrification was hidden behind the pastel walls, with modern conveniences provided at no small cost. After experiencing this touch of heaven, I was still confused as to why there was an equally imposing style. Until, that is, I looked up. I saw the beautiful clock tower of old Havana and the serious looking windowed box of the government building in the same image. And then it hit me: Cuba’s charm is its fluidity, changing from socialist modernism to consumerist tourism in the blink of an eye. Like their delicious plates of rice and beans, the bland but necessary rice is complemented by the juxtaposition of the hearty and flavorful beans. Yet were one not to exist without the other, the system would fail. So as I sit in my rescidencia in one of the East German-esque apartment buildings, facing the Hotel Presidente, I can appreciate the almost hidden art in its existence. Next to the harsh reality of Communism lies a plaza of bliss, creating a society of determined yet generous people. With an expansion of American pop culture in the city and an ease in tension between neighbors, I am left to wonder. Will this Caribbean Gemini continue to shine for future generations. ?